Belleville Mennonite School senior Olivia Bell, front center, signed her letter of intent Wednesday to play field hockey at Mansfield University. Joining Bell are, from left, front, parents Steve and Kristel; back, Chelsea Sarra, Huntingdon High School field hockey coach; Kaitlin Byler, Bell’s sister; Steph Hoffman, BMS athletic director; and Starla Fogelman, BMS superintendent. Byler and Bell were part of BMS’ 2016 District 6 championship team. BELLEVILLE — The passion Belleville Mennonite student-athlete Olivia Bell has for field hockey is undeniable. Her enthusiasm and skill level is the reason why the senior midfielder will continue playing at the next level. 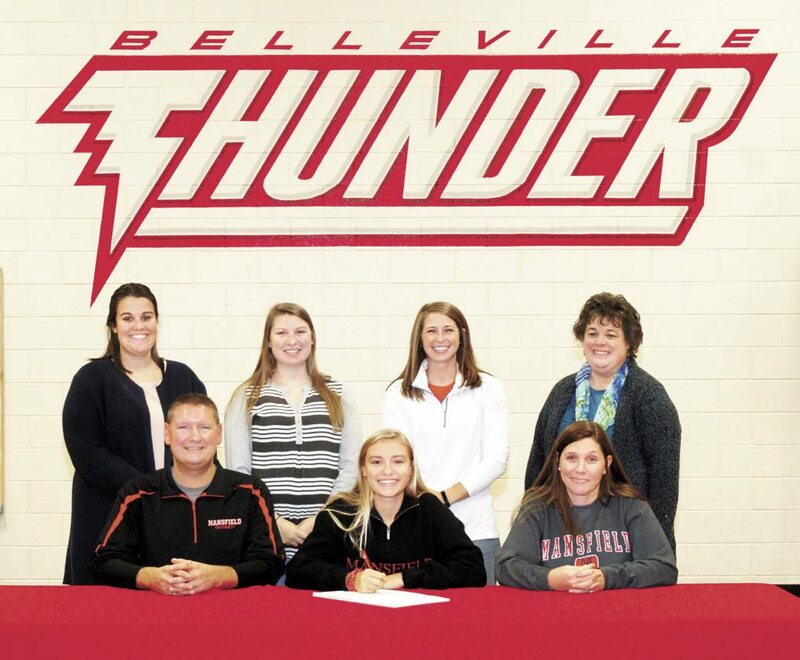 Bell signed her letter-of-intent to play field hockey at Division II Mansfield University Wednesday afternoon at the Thunder gymnasium surrounded by family, friends and coaches. The reason she chose the Mountaineers was a simple one — the personality of Coach Brittany Hansrote. Mansfield finished 8-10 overall and 3-7 in the PSAC conference. Bell believes her talent at both ends can be beneficial to the Mountaineers. According to Bell, participating in club hockey during the offseason made a big difference in her game. “Before I did club hockey I wasn’t very serious about the sport. Club hockey opened up a new world to me and made me better, so I think both my offense and defense will help Mansfield, hopefully, progress to the postseason next year,” Bell said. Morgan Foote, former BMS coach, now living in North Carolina, has fond memories of Olivia’s hard work, dedication, and love for the sport. The past year was a tumultuous one for BMS. After winning a District 6 Class A championship in 2016 and advancing to the PIAA quarterfinals with only 11 on the roster, the Thunder lost their coach and couldn’t field a complete team in 2017. The solution? Form a co-op with Huntingdon. Bearcat coach Chelsea Sarra said the co-op was a success and one of the reasons was the play and attitude of Bell. Foote knows Bell will have a successful career at Mansfield, both athletically and academically – the reason being Bell’s desire to improve and her solid character. After three years of hockey at Bellville Mennonite and a year with Huntingdon, despite the drastic changes that took place in the past year, she wouldn’t change a thing.